Combine grated coconut, jaggery, cumin powder, cardamom and a pinch salt. Heat water in a pan using 1/4 tsp salt. Add the hot water little by little to the rice flour and knead well with the hands. Divide the dough into equal portions and make small balls, flatten them with your hands and fill it with coconut filling. Close the dough from all sides and shape the kozhukkatta with hands. 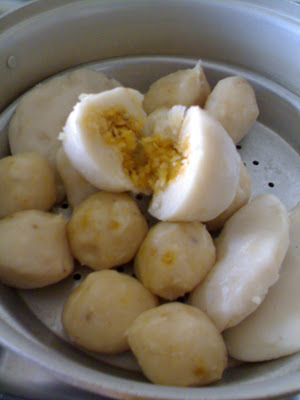 Steam them in idli cooker for at least 10 – 20 minutes. hmmm njagalude fav snack anu..Looks delish..
Kozhukatta looks superb!! Love it..Njangalum ennale kozhukatta post cheythirunnu - sweet versionum nadanum..